Today we have a special edition of 5 Questions. First off, it’s actually nine questions. And secondly, there’s some history here! Back before the days of the Internet, it was hard to tell what was going on in the prep running scene outside of your home state. The only real information that was out there came in the mail once a month in Marc Bloom’s “The Harrier.” Beyond that, you could see the Foot Locker nationals every December on ESPN. I began my high school running campaign in the fall of 1993 and was happy to break 18 minutes that year. Times were different then! I kept reading each month about this rising star in Saratoga Springs, New York, that was just dominating the upperclassmen. Her name was Erin Davis. She was my age, but would have whipped me. I saw her run on television later that fall and win the Foot Locker title. I was impressed, and a little smitten. So I drafted up a two-page letter and threw in my cross country individual photo (do they still make these?) and sent it off to Saratoga Springs High School, Attn: Erin Davis. Much to my surprise, a few weeks later I got a response. The young phenom took the time to write me back and throw in a photo of her own. What a thrill! Flash-forward almost twenty years… Say what you want about social media, but it is a great way to find people. Many of the interviews I conduct are from Facebook and Twitter introductions. Times have changed and I’m ok with that. While on a run one day, I began to think what Erin was up to. A few clicks later, and here we are! 1. Daily Relay: This fall marks 20 years since your sensational freshman year that ended with a Foot Locker National Championship. What are some of your favorite memories that you have from that season? Erin Davis: The build up to the event. After coming off track season as an eighth grader with the fasted time in the nation for the 3,000, I felt I had a chance of at least making the top ten at Footlocker Nationals. I felt like I had an adrenaline rush that never ended, and all my training/racing came seemingly effortless. On top of that, my team was really on a roll and they certainly helped my success. I don’t think many people know that as a team we were ranked #1 (in the nation) that season. Going on to win Nationals as an individual just topped off an amazing season. 2. Daily Relay: You were part of a storied Saratoga Springs team that continues to compete for national titles on a team level year after year. In your opinion, how do they do it? 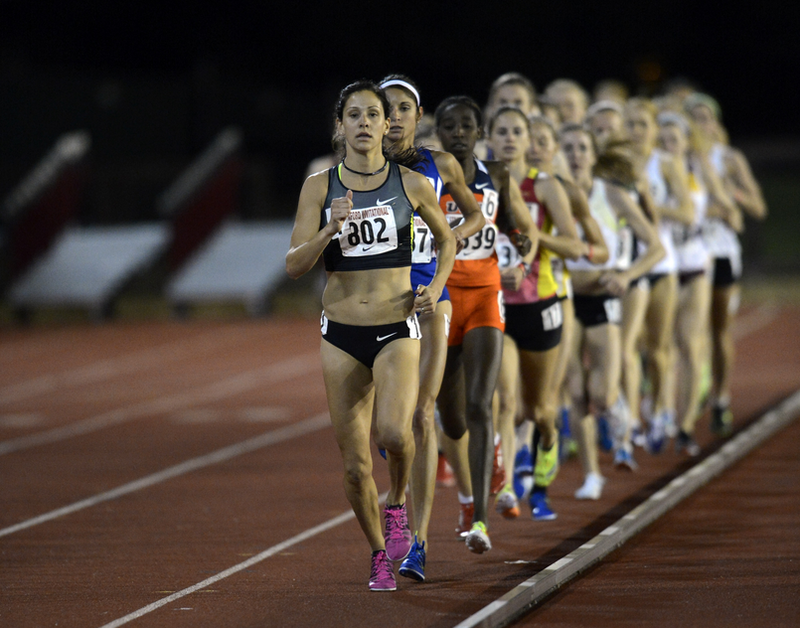 Erin Davis: We are obviously rumored to have gone through strict training and rules under our coaches Art and Linda Kranick regimen, which is true, however, it was the attitude and commitment we put into daily training. I guess I can say that all of my teammates and I were the type of kids that parents and coaches didn’t have to worry about. I don’t think I had any teammate that was the type to skip practice. We were all pretty wise and knew hard work would pay off. Once you get a taste of winning as a team, along with the pressure to keep winning, it’s nearly impossible to back off. Our parents played a major roll, as they all helped one another in support of our team. I remember my parents arranging car pools to and from practice, and also to the far away meets. Our parents also worked bake sales at home meets and obviously purchased our training and racing shoes without hesitation. They were on board with our goals. 3. Daily Relay: You continued your high school career with two more returns to Foot Locker and quite the resume. What were some of your favorite takeaways from being a prep star for four years? Erin Davis: I’d like to think my favorite takeaway was the Foot Locker title, but honestly, my senior year was my best memory. My team was back on top and we all had a lot of fun. It was a different attitude that year, as the prior year we were all a little burnt out and down from losing the national title, and I didn’t even qualify for Foot Locker my junior year due to a number of reasons, but I came into my senior year not putting any pressure on myself to win. I just wanted to like running again and enjoy my last year with my friends. I remember so many inside jokes we had and the encouragement we gave each other at practices, as well as hanging out after practice. The former years, I was not really friends with my teammates…we just worked together. Senior year we all got along and had more of a bond. I believe we all (top 7 girls) broke 18 minutes on our home course that season (1996) and that had never been done any other year, which is amazing. My senior teammates and I all got into the schools of our choice, and looking back at that is a special memory. 4. Daily Relay: You went on to Penn State and caught the injury bug. What did you learn from your years as a Nittany Lion? Erin Davis: I was injured right away and knew exactly why. I realized a lot of my motivation was dead after that and that I thrived off a structured day. It was hard for me to find a way to want to find a way to structure my day focusing on athletics. I didn’t want to be there and kind of just held on those four years. I’d have somewhat of a comeback, then another injury would set me back. Most of my injuries were due to inconsistent training. Many will say I was burnt out, but I have not stopped running to this day. I could have used a little break from racing so often and the speed work involved. But the only thing that keeps me motivated to run is being able to run and feel good. 5. Daily Relay: Your name has has popped up a few times in recent years with you competing in a few marathons. Are you running these days? If so, how much? Erin Davis: Yes. I run about average of 5 days a week. There are days I may run 90 minutes to just under 2 hours, but no more than that. I teach downhill skiing in the winter, so then it’s about 3 days I run. But I love to run. Racing has never been a motivating factor. If I feel good, I sometimes enter, but its never planned. That is why I do well in the marathon. I don’t do the workouts. I just run consistently. In a marathon, anything can go wrong. You can train all you want and do the speed work involved, but if you have a bad day, it’s not going to help you. So I go into these little races I enter with no pressure other than to finish. I just try to find a good pace I can maintain and hold on. It works for me to run under a 3 hour marathon. With training, I can honestly say I’d probably be able to run in the 2:40’s, but it’s not worth it to me. It’s not going to get me anything I want other than bragging rights. I already broke 3 hours and that is pretty good! In high school, I couldn’t imagine I’d ever be able to finish a marathon. Just consistently running all these years has allowed me to do this. Your body doesn’t know or care how much you run on a daily basis. Just like calories consumed over time…it does not matter what you eat at each meal, it’s how you space it out. If you overdo it, you will feel bad. Visa-versa. Its pretty simple! 6. Daily Relay: The high school cross country experience is one that thousands of kids have every year. What are a few tips you can give to kids coming in as freshmen this year? Erin Davis: I don’t have advice for high school freshmen other than if you don’t like to run, find another sport. It’s a different world these days. I just hope some of the kids will have a life long love for just running to keep healthy and feel good. I did coach at one point and some of my former athletes still run, even if they didn’t run in college, simply because they learned it keeps them balanced and healthy as individuals. That is a miracle to me. 7. Daily Relay: Saratoga Springs seems like a great place to train. What are some of your favorite trails, etc. up there that visitors would want to put on their “must” list? Erin Davis: Yes…Saratoga is a great place to train. But I don’t train there other than a few runs in the SPA park. Downtown is nice during the fall after the busy summer to look at the historic homes, but it’s a lot of stop/go. I prefer to run up in the Glens Falls/ Lake George area on dirt roads and bike paths or long country roads. I like to run on the Feeder Canal Path in Glens Falls past the industry that once thrived in this area…the paper mills. People may think that is crazy, but i enjoy it. It’s a nice stone dust path that goes for miles all the way to Fort Edward, with a little part you have to trek through downtown Glens Falls, where I was born and raised until I was in 2nd grade. So that nostalgia may play a little part in my liking for this path. It’s all about where I feel most relaxed. In the summer, I run a lot in Hague, which is a great hilly town in the northern part of Lake George. It’s beautiful and the hills keep me strong. 8. Daily Relay: People (like me) wrote physical letters to you after your success in high school. How much fan mail did you get? How did you handle it? Erin Davis: I pick and chose my letters to respond to. I could tell the right from the wrong and really liked being able to help someone find a motivation to reach a goal. Most would want to know training secrets and I tried to emphasize there are none other than consistency and how bad you want to win when it comes to the race. My coaches and parents obviously screened and monitored a lot of this. 9. Daily Relay: Are you still running? What are you up to these days? Erin Davis: Yes. I still run for health and fitness since it makes me feel good. I am currently enjoying my summer, as my job as a teaching assistant has just ended. The weather is getting cooler and I start to get excited about skiing more than anything in the fall. I was a lover of downhill skiing long before I found a love for running! A great story on Erin Davis, Pat. As a coach in Section 2 during that time period, I certainly remember Erin with awe and respect! I was in San diego (coaching Jen Fazioli who finished 10th) and stayed with Erin’s parents across from the Hotel Del Cornado! It was a wonderful experience! Erin was a pleasure to watch run all through HS, and I still run into her every now and then in “the North Country” she loves! This interview was a nice surprise! When I was a freshman, Erin Davis was a senior, and both her and her team (and Jen Fazioli) were legends in NY State running circles, however, the attitude that many high school coaches had about Ms. Davis at that time was: “she USED to be good, and then she burnt out.” Erin certainly proved them wrong her senior year. I remember competing at the NY State xc meet in Canton where the course got flooded and we ran w/ water up to our shins and Erin completely dominated the field. 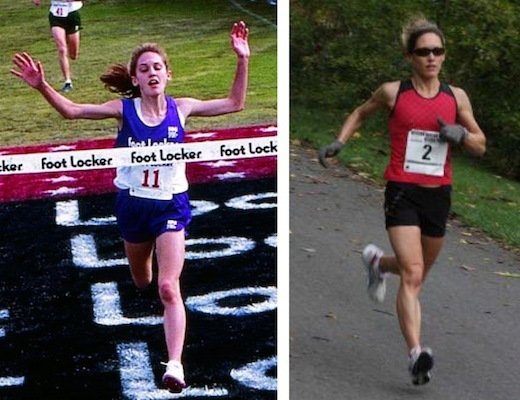 She had developed into this incredibly strong runner, physically and mentally, and seeing her win states that year left an impression on me for years to come. I always wondered if she knew just how much of an impact she had left on NY state distance running, but I guess she must’ve, what w/ all the fan mail she was getting!